The current White House is outraged with Donald Trump and the self-obvious remarks he keeps making about all the insanity this government keeps trying to shove down the throats of the people who once lived here. For instance, in a press conference today, here's part of what “Josh” had to say. The problem with the statements issued by this White House is that they are all false. When it comes to religion we used to keep the government out of personal religious beliefs until George Bush & Obamanation came to the circus and have rearranged all the tents. Once upon a time (for the last few hundred years) we used to celebrate Christmas as a national holiday. Since we've had the White House, there used to be a Christmas Tree in honor of the holiday season prominently displayed ­ not to celebrate the Christian religion but to celebrate the season of which Christmas was and is still a part. Now there's a Menorah on the White House Lawn to supposedly celebrate the same season but that only honors a little over three percent of the nation ­ the Jews ­ who have forced the issue by filing suit, in order to do away with all displays of all things that might possibly celebrate anything Christian: Meanwhile no one questions why or how it came to be that the Jews have now taken over center stage during the Christmas Season—it certainly can't be because the Jews are known for their generosity, or their humanitarian celebrations of other men and women? In fact what we have now is the government dictating to every American which religion we can have opinions about and which religions we cannot be allowed to have any opinions about, especially if those opinions are “negative”. Freedom of Speech, Freedom of thought and the freedom to decide anything for ourselves has all been banned by the new politically correct garbage that's being peddled directly from the White House as the only thing that Americans' can be allowed to do—no more private thoughts and definitely no more dissenting opinions about any of the new found friends of the racist Communist, Muslim people that seem to have become a flood when most American's weren't looking. 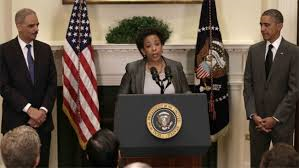 The proof of this is that Loretta Lynch who just yesterday promised to arrest anyone who fails to follow her advice: She's the currently appointed A.G., who was never elected to any part of that office, she's just another Obama Czar, masquerading as a government official, but who in reality is nothing but a overpaid shill for the fascist takeover of the nation. Across this country many things are changing very rapidly as well. Oh and those lines at airports waiting to be scanned or groped by TSA? Those aren't necessary for these creatures we used to call 'Illegals'. Because by a very strange twist of fate, the same sacred nation that this White House claims to represent, has decided that we shall no longer have rules or borders, because we are not allowed to refer to people coming into the U.S. as legal or illegal, they are simply coming here to be part of America, no rules need to be observed, and the newcomers cannot be refused! The new arrivals don't even need to identify themselves, because they're protected from the police-state: Unlike American citizens. … “On Thanksgiving the New York Times ran an editorial that pretty much laid out what the liberal viewpoint is on people coming to live in America. Point number one: The left no longer distinguishes between illegal aliens and those who come here legally. All foreign nationals who enter are now described by the Times and others as immigrants. And if you use the term illegal alien, you are a bigot. Point two: The left believes that any fence on the southern border is nativist bigotry that is a hateful action towards non-Americans, especially Hispanics. Point number three: The left wants open borders, no restrictions on those who come here, no detention, no physical barrier, no deportation proceedings unless a serious crime other than illegal entry is committed. And if you disagree with that you are promoting an anti-immigrant police state. Point four: The left says all immigrants -- again illegal and legal -- should be welcomed and assimilated. And not only that, the government should give them money to settle in and they should be immediately eligible for all the entitlements Americans can secure. Point five: All illegal aliens already here should be put on a pathway to citizenship. The left wants full amnesty. And finally point number six: The left wants free lawyers for all immigrants so they can gather up the entitlements and citizenship requirements. At the end of the editorial in the New York Times, the paper asks is that so radical? The answer of course is yes, open borders, full amnesty, complete entitlement access is indeed radical and dangerous to public order and safety. But that is the vision of the Democratic Party. Not everyone, but you will not hear many Democrats go up against that, as the Kate's Law debate demonstrated. Now many believe this is a pure political strategy, that flooding the nation with foreigners -- many of whom will get the right to vote -- strengthens the Democratic Party. But there is much more in play. The radical left immigration vision would profoundly change all of America’s traditions, all of them. And that's what the left wants because that ideology sees the American Judeo-Christian tradition as oppressive, exploitative and a white-privilege legacy. Thus, the uber-left wants traditional America wiped off the face of the earth. That's what is truly going on and if Americans don't wise up quickly, the left-wing vision of immigration may very well become a reality.